Rural life in the 1930s was a cycle of hard work and hardship because 90 percent of farms didn’t have electricity. Nebraska Senator George Norris was an early booster of bringing power to farms through publicly controlled entities. In May 1935 President Roosevelt created the Rural Electrification Administration, which helped start the process. The first directors were: Beemer township, Claude E. Galbraith; Bancroft, R. Chester Graff; Cleveland, Eugene Dowd; Bismark, Otto Schlueter; Blaine, Herbert Albers; Elkhorn, Herman Meiergerd; Garfield, Earl Anderson; Grant, Herman Schweers; Lincoln, Anton Renemeyer; Logan, John H. Keller; Monterey, John J. Heimann; Neligh, Christ Jahnke; Sherman, Rudolph E. Mack; St. Charles, Robert Brockman; Cuming, Peter Thompson; and Wisner, Henry A. Heyne. Joe R. Watson was appointed secretary, a role he kept until his death in 1972. In 1942 the number of directors was cut to eight, and in 2000 to seven. On November 18, 1936 the official organizational meeting was held and officers were elected. C.A. Sorenson was hired as the attorney and Midwestern Engineering Company from Hastings was hired as the engineer. Lester Sellentin became first project superintendent on October 16, 1937. He was later named the first general manager. The original directors and Sellentin spent much time planning, staking lines and gaining loan approval from REA. Virginia (Beckenhauer) Guretzky was the first stenographer/bookkeeper and Walter H. Dewitz secured easements. They were hired in 1938. As the customer base grew two linemen, Harry Senden and Grover Nitz, were hired. These were the only employees until the early 1940s. Imagine the excitement at the county fair in 1938 when the switch was pulled and the first lines were energized. That December there were 347 customers on 210 miles of line, using an average of 44.9 kilowatt-hours per month at 7.8 cents per kwh. For a minimum charge of $3.50 customers could have lights, operate a washing machine, churn, iron, cream separator, radio, toaster and sewing machine. 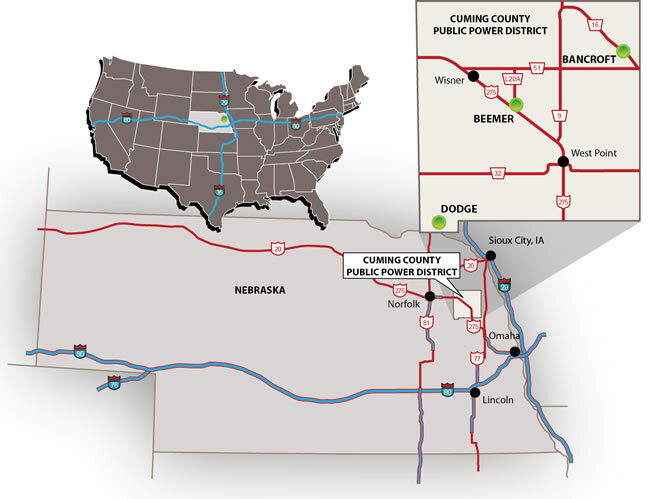 In 2006 there were 4,025 services in place and 1,540 miles of line. Customers used an average of 1,880 kwh per month at a cost of 7.9 cents per kwh. In 1938 the District bought a half-ton Plymouth with 6-ply mud tires for $530 from Leisy Garage. In 1951 the first 3-1/2 ton truck and boom cost $2,927. In 2006 a one-ton bucket truck cost $115,000. The first office was shared with the Agricultural Extension Service on the north side of West Park Street. The office then moved across the street to the basement of the old post office (later torn down). In 1950 a new building was constructed at 500 South Main, the current location. Additional warehouses were added and a new pole yard was built in the industrial tract on South Beemer Street in 1991. The former rural customer base changed in 1999 when the District started serving the villages of Bancroft, Beemer and Dodge. There have been several common themes throughout the District’s 70 plus years. Three of these themes are safety for the workers and the general public, low rates based on costs and commitment to the local community and electric industry. It is important to remember two linemen who lost their lives while on the job, Leonard Zobel in 1949 and Mike Deemer in 1976. Past managers were Lester Sellentin, 10/37-5/49; Al Chantry, 6/49-1/64; Bob Mace, 2/64-9/73; Tom Thomas, 11/73-1/85; Cecil Woodka, 2/86-10/98; Elwood Moore, 11/98-8/14; and current manager Chet McWhorter, 9/14-present. Current directors are Greg Strehle, President; Leroy Mostek, Vice-President; Dennis Weiler, Seretary; Ed Kaup, Treasurer; Danny Kluthe and Fred Schneider. Dedicated directors, managers and employees have all had a hand in making the District what it is today. Thanks go out to the late Joe R. Watson who started the ball rolling because he wanted to have every farm place in Cuming County electrified. Thanks also go to the late Senator Norris and the people of Nebraska who were committed to public power, which has become a Nebraska tradition. We’re proud to be part of improving rural life in the area by providing electricity for over 75 years.